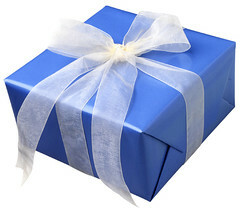 Trends In Adulthood: Is Gift-Giving Obsolete? Whether you celebrate Christmas, Hanukkah, Eid or Festivus, I’ve got news for you: gift-giving is soooo ten minutes ago. A series of initiatives, large and small, suggest that presents – at least in the wrapped with a bow, purchased in a store variety – are rapidly going the way of the Post Office. Today I’m over at PoliticsDaily.com talking about why I’d really prefer it if you just gave me a goat this Christmas. Image: Gift Box by Weddingmusings via Flickr under a Creative Commons License. I so agree. Although if the alternative is paying down the National Debt then I might still prefer bath salts ! My particular seasonal irritation – when people ask you what you want for Christmas – not in the spirit of getting you something you really want – but more in the spirit of ‘solving a shopping problem’. Why does no-one want to belive you when you say I’m fine and don’t need anything ? If that doesn’t work – this year I’ll propose the goat giving. Love this Sally!One of my colleagues over at PoliticsDaily suggested a “white elephant” party where everyone wraps up something totally random that they don’t really want/need from their homes and does a grab bag. I think I may institute this one as well! I do not want more stuff. My husband and I got married last year and merged two complete households (we are 44 and 46). We neither need nor want stuff. To make matters worse, we are then expected to spend an equivalent amount on each gift event ($100!). I would rather pay off my mortgage, thank you very much. I want to de-escalate gift giving. If they will not cooperate and NOT GIVE US ANYTHING AT ALL, which would be fine with me, then pay for our tennis classes next summer. Buy us play tickets. Buy us an experience. But quit giving us junk. And no. Do not donate to charity in my name. Their political views are polar opposite to mine and I shudder to think of what they would give. Plus I think it is presumptuous to give to charity in someone else’s name. I hear you, class factotum! I think life would be so much simpler if people asked us what we wanted (including “nothing”) rather than feeling obliged to give something. And then you feel obliged in return…and it just feeds on itself. See above for the idea one of my colleagues had!